The city council of the German city of Potsdam, near the capital Berlin, has decided to cut the funding for the annual Saint Nicolas parade after protests from action groups European Network for People of African Descent (ENPAD) and Kick Out Zwarte Piet (KOZP). Potsdam is a “Dutch Quarter” which arose in 1730 as a housing project for Dutch workers. Dutch people have been celebrating the controversial Dutch tradition in the city for years but Germans people of African who felt offended by the Dutch blackfacing tradition protested againt the racist caricature. ENPAD is a European network of people of African background with members in Germany, Sweden, England, Belgium and the Netherlands. 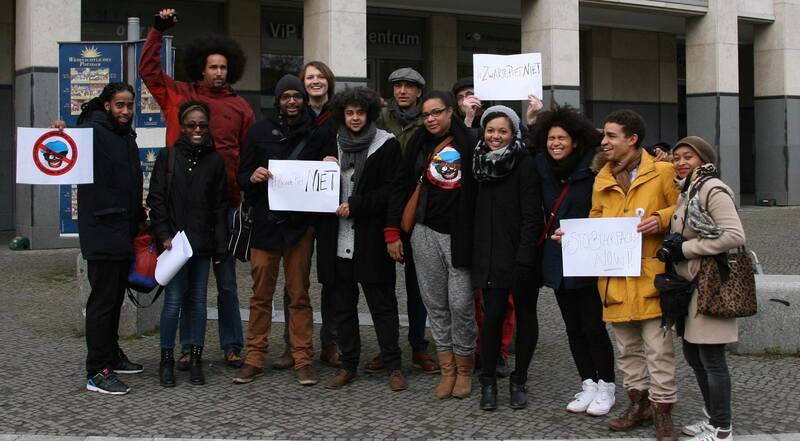 Members from Germany and the Dutch action group Kick Out Zwarte Piet and Stop Blackface organized a protest at the Sinterklaasintocht in Potsdam last year. They also with with the Dutch Embassy in Germany. On November 14 Kick Out Black Peter is organizing a nationwide protest during Sinterklaasintocht in Meppel “Freedom Ride to Meppelr”. Register via the website! Read the press release about the protest in Potsdam here.